Morning. I already ate what bread the hotel provided last night as a late night snack. 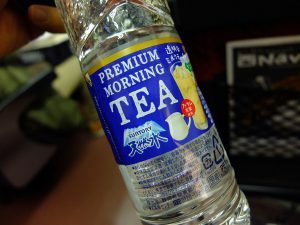 To find breakfast I went out to the 7-11. Snow had fell thick overnight and the roofs and grounds were covered in snow. Not the roads though. Kusatsu ran hot water from their onsen heat exchangers beneath the roads and made them snow proof. 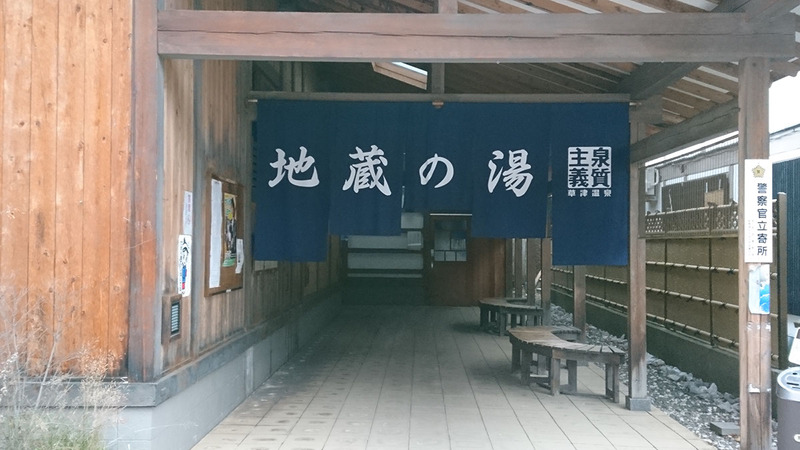 After breakfast I grabbed the towel and handbag and headed to the Sai no Kawara bath. It was too cold for yukata, it’s okay though since Sai no Kawara was a paid bath with changing rooms and supposedly had lockers. 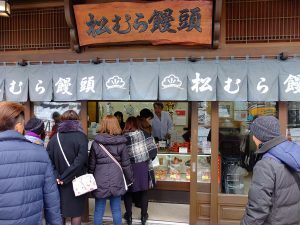 The shops were still closed, quiet, except the manju shops filled with activity behind the shut store front, steam rising above them as they steamed manjus in preparation for the day ahead. 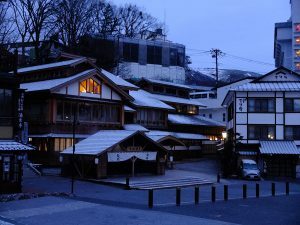 The snow covered Sai no Kawara park was yet another feel different from yesterday and yesterday night. It was frozen and still, the spell broken only by the rising steam. 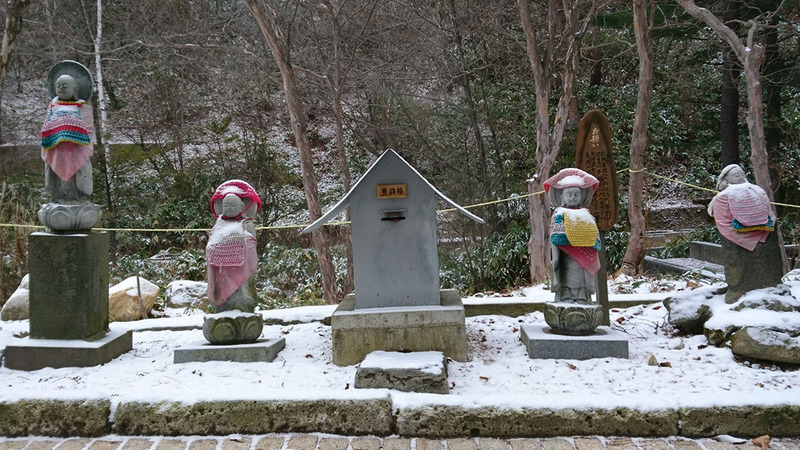 The snow covered Jizou statues wearing hoods and cloaks were a delight out of Japaneses folktales. 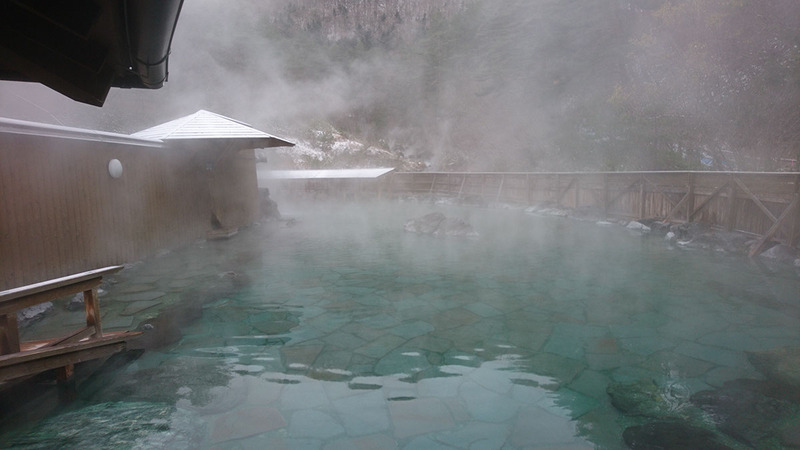 The Sai no Kawara onsen was famous for its large outdoor bath, since there was plenty of onsen water it could afford to be wasteful. 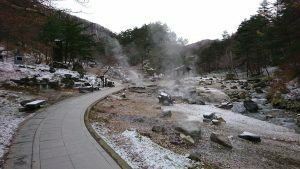 Despite its size its water remained very hot. Above average, not as hot as Shirohata no Yu yesterday. Near the entrance the water was the coolest as the hot water was fed in from about 2 /3 down the length of the bath. There were three other bathers but they soon left, and I had the huge bath to myself. I floated in the water, watching the steam rising all around toward the cloudy skies, losing track of time and self, in that moment the whole universe was contained in that bath. It was a strangely unsettling experience. After the onsen bath the shops were starting to open. The shops here also opened early, no doubt to take advantage of people who stayed overnight who were now looking for souvenirs to take home. Especially the manjus which has to be eaten fresh. A small incident happened on the way, I dropped my tripod and something came off. I picked it up and looked it over. The plastic head holding the mount to the pole had completely snapped in two and was unrepairable. A lot of little accidents on this trip so far. 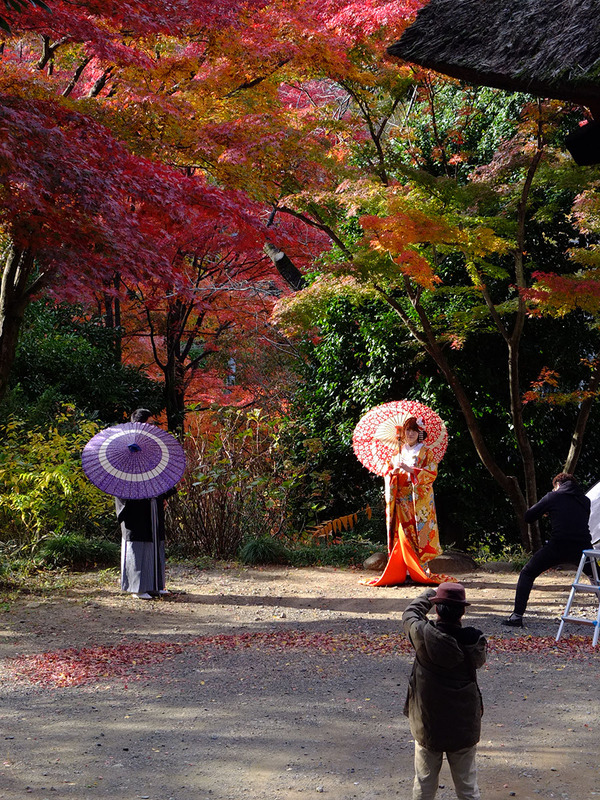 This one could be addressed, have to make time to go out and buy a new tripod once I get back to Tokyo. I return to the hotel and checked out, leaving my luggage there to be picked up later. 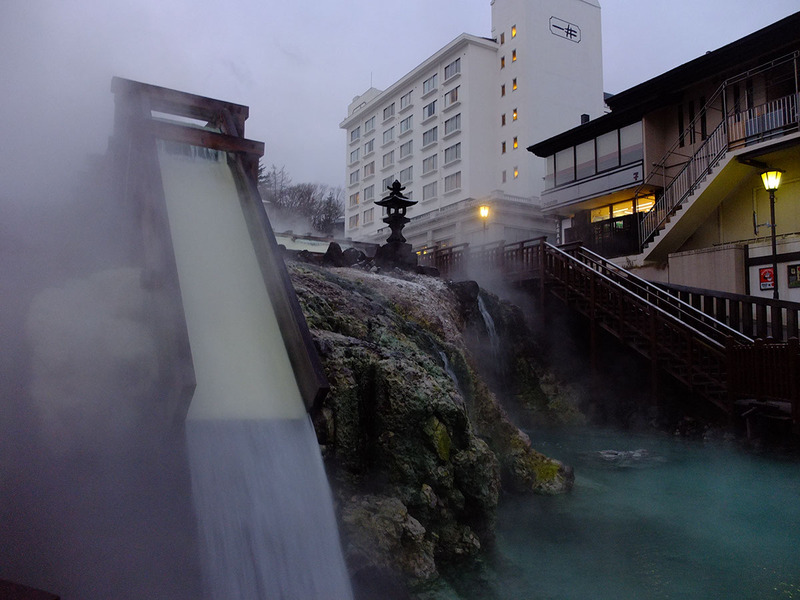 There was one last thing to experience in Kusatsu. 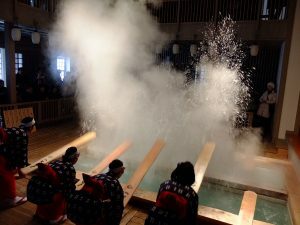 Because Kusatsu’s onsen is so hot, people in ancient time had to wait a long time for it to cool before able to take a bath, so overtime there developed a special tradition of cooling down the water by stirring it with a giant paddle and jikanyu “timed bath”, where one paddles the water to cool it, pour the water on one’s head and then bathes for exactly 3 minutes on the command of a bath leader. 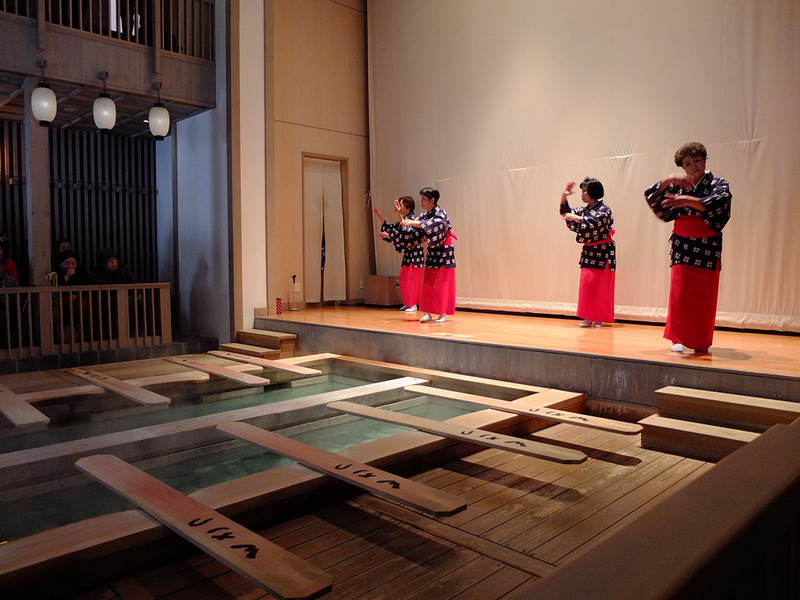 Overtime the paddling became a song and dance tradition which is still performed in the Netsu no Yu. For those interested in the full on experience there are baths in Kusatsu that hosts timed baths. 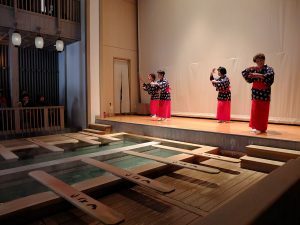 The Netsu no Yu puts on about 3 performances each morning and afternoon, the later afternoon sessions become quickly packed as this is one of the first things guests would think of doing after checking in. The performance itself is only a few minutes. To create a more complete experience they added more elements to create 4 segments The first is a traditional dance performed on stage, then the yumomi performance, then audiences are invited to try to paddle the water as part of the yumomi themselves, then finally a slightly different yumomi performance that ends with a giant splash of water. 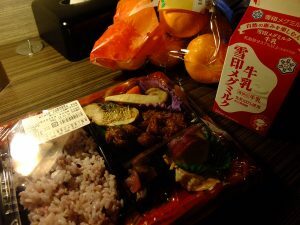 After watching the performances I bought some sweets and manjus to bring home, picked up my luggage and went to the bus terminal to begin the journey back to Tokyo. The bus was full. Wait what? If I couldn’t get on this bus, the next bus was not due for another hour and half. Thankfully the staff explained that they were bringing in another bus and that there was a 30 minute transfer time at Naganohara-Kusatsuguchi, there was no worry about missing the train. Looking around, there were almost 20 people in the waiting area waiting on the second bus. I wandered around the bus terminal for abit, checking out the souvenir shop and eatery here. The souvenir shop occupied a small space in one corner of the waiting room. What’s sold here did not defer much from what’s sold in other shops. Mostly sweets and onsen made beauty products. There’s an eatery downstairs, the menu looked like it would be a decent choice for lunch or dinner if one wasn’t picky. About 10 minutes later the bus showed up. 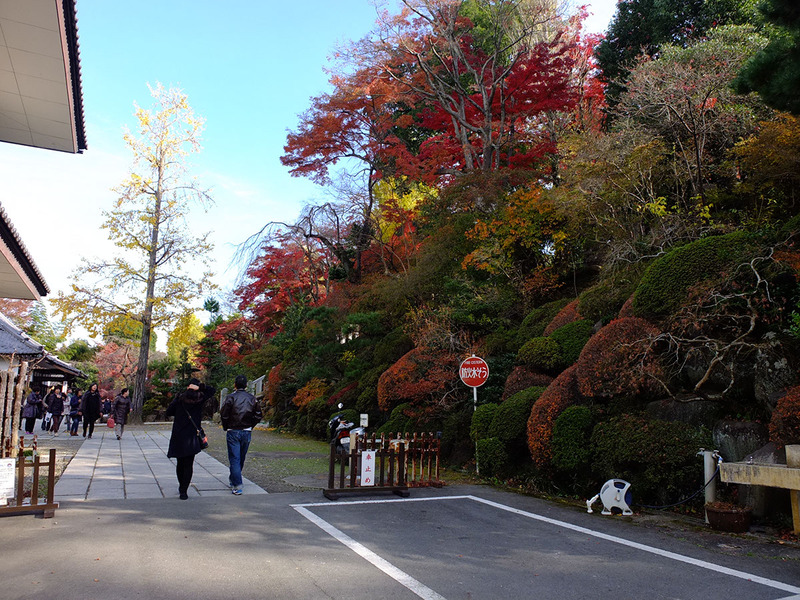 The driver asked if there were anyone who was not going to Naganohara-Kusatsuguchi station. There were none. So the driver turned the bus into an express and drove directly to the station without stopping instead, arriving only a few minutes later than the previous bus. The train was once again a local train except this one didn’t go all the way to Takasaki, instead everyone had to transfer at Shin-Maebashi, about 3 stops north out from Takasaki. The transfer was simple and well timed like most Japanese connections, simply walk across the platform to the waiting train. 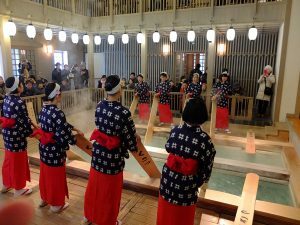 The communities along the line likely didn’t have enough patronage to support frequent services, combining tourists going to Kusatsu onto the local trains was a way to increase the number of trains and made life a little more convenient for the locals. Still given the number of people visiting Kusatsu I could not help but think that they could add one or two more express services a day. Currently there were only two express trains on weekdays, both timed to be more convenient for tourists coming to Kusatsu (noon and afternoon for check in at hotels) but not quite as convenient for those leaving (leaving in the afternoon and late afternoon, none if one wanted to leave in the morning). 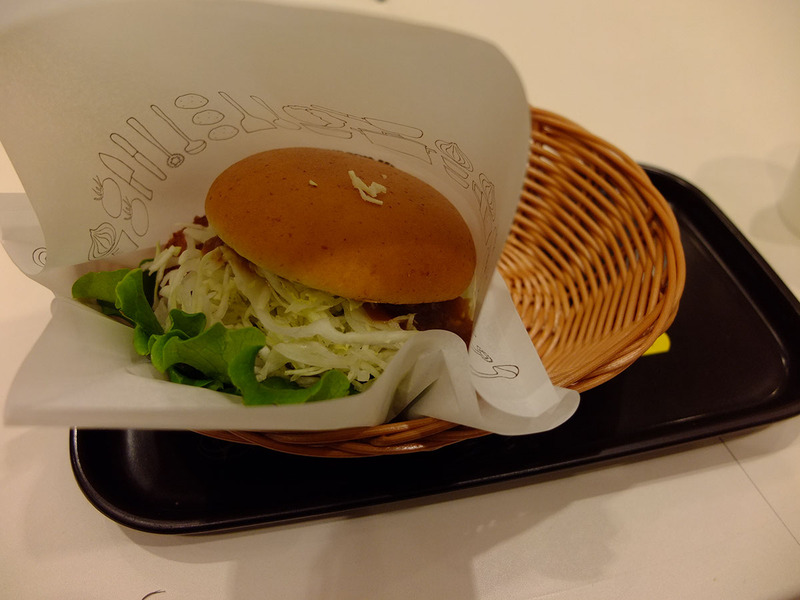 By the time I got to Takasaki it was almost 1pm and I was starving. 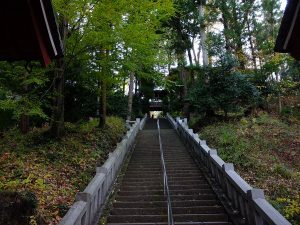 I planned to go the Daruma temple in the afternoon and there was only one train every hour. The next one was at 1:22, I had less than half an hour to toss my luggage into a locker and get lunch. Doesn’t look like I have time to go to that kamameshi (rice in a pot) place. First thing first, I followed the signs to the lockers, downstairs and past a food court. I didn’t have enough changes on me, stupid locker only takes 100Y coins. 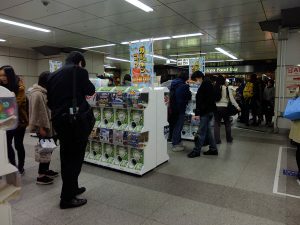 I looked about for a coin exchanger and noticed there was also a row of lockers that used suica to access. Even better. I chucked my luggages into the locker and swiped my card. Now, as to the problem of lunch…. I turned to the nearby foodcourt passed a moment ago. 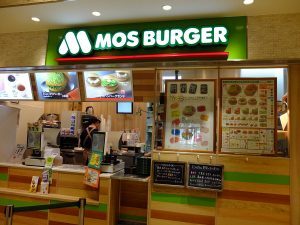 There was the same Nagasaki noodle place I had last time in Hakata, a ramen place, some rice don place. 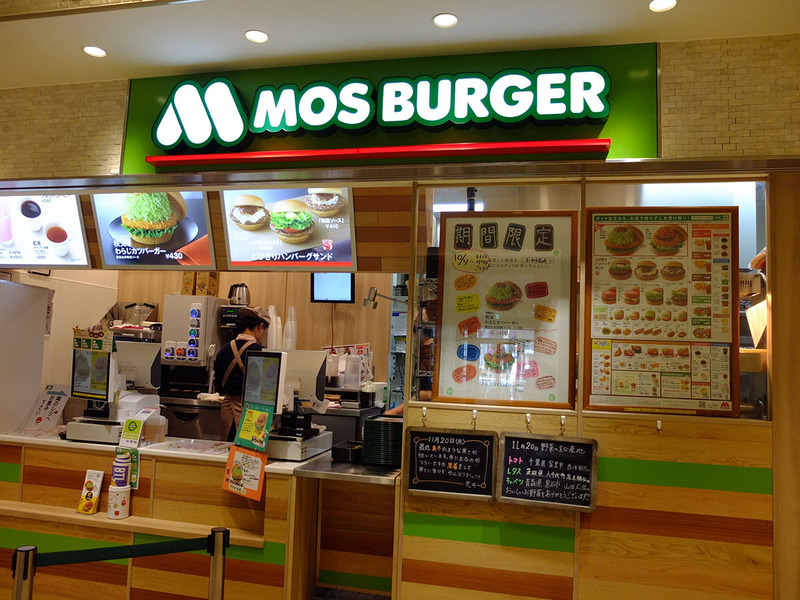 Oh, a Mos Burger, perfect. Unadventurous, quick, not too pricey and easy to take with me if time runs short. I ordered a seasonal special and found a spot to sit. The food court provided drinking water and paper cups and disposable teatowels to wipe down the tables. Never noticed that on previous trips. 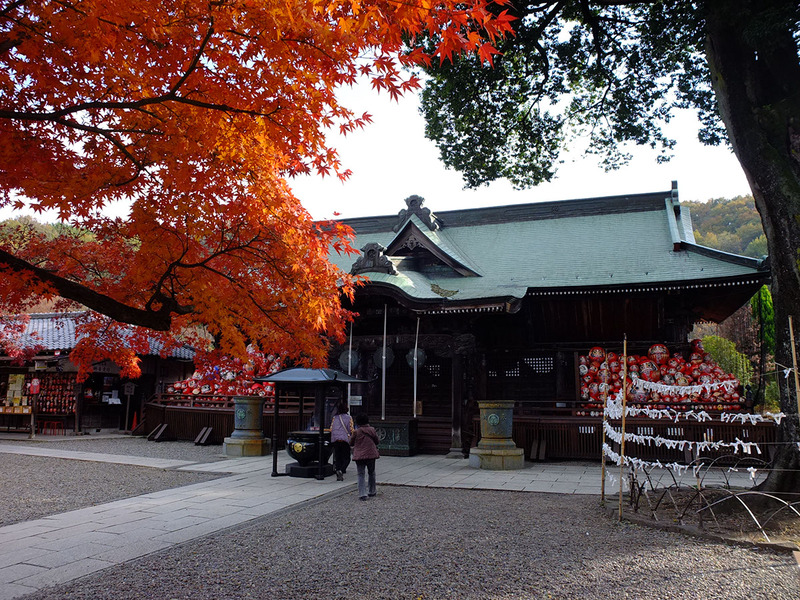 Daruma temple in Takasaki is said to have been founded several hundred years ago original as a temple of worship of the 11 headed kannon. During a flood a piece of black wood was seen giving off miraculous light and was preserved. An old man later dreamt of Daruma commanding him to carve a figure of him using the black wood. Thus the temple was born. 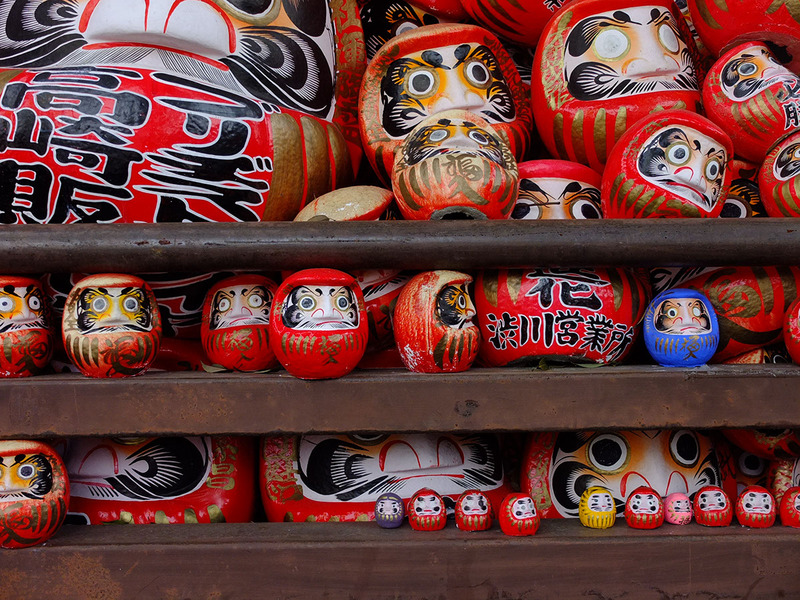 Daruma was a legendary monk who was said to have also started the kungfu tradition at the Shaolin temple. The temple’s full name is Shorinzan Darumaji or Shaolin Mountain Daruma Temple, whether there’s any connection between Shaolin in China and this one is unclear to me. 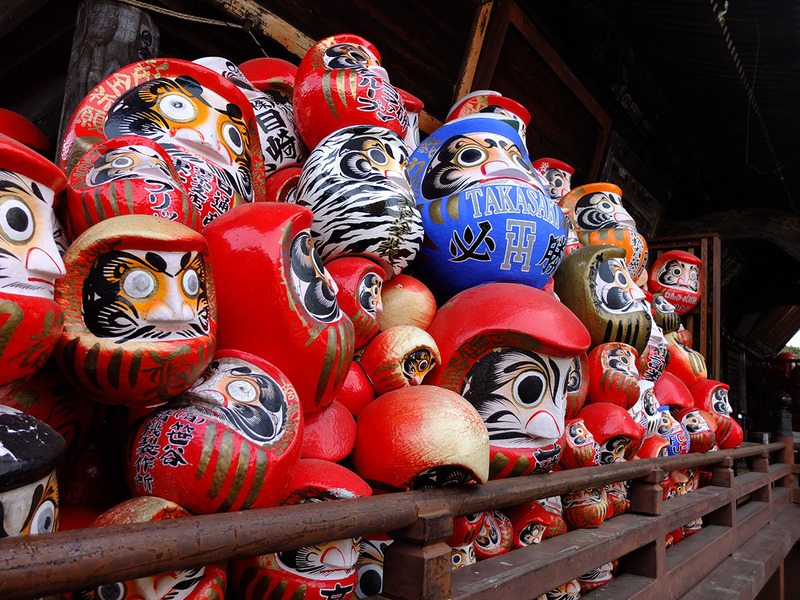 There is a tradition involving Daruma dolls, a rounded doll in the image of Daruma. 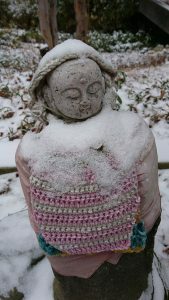 The dolls are created with blank eyes. People who wished for something was to paint the left eye of the doll when making their wish, then complete the other one once their wish become true. This is why there are mountains of dolls piled up on either side of the worship hall. 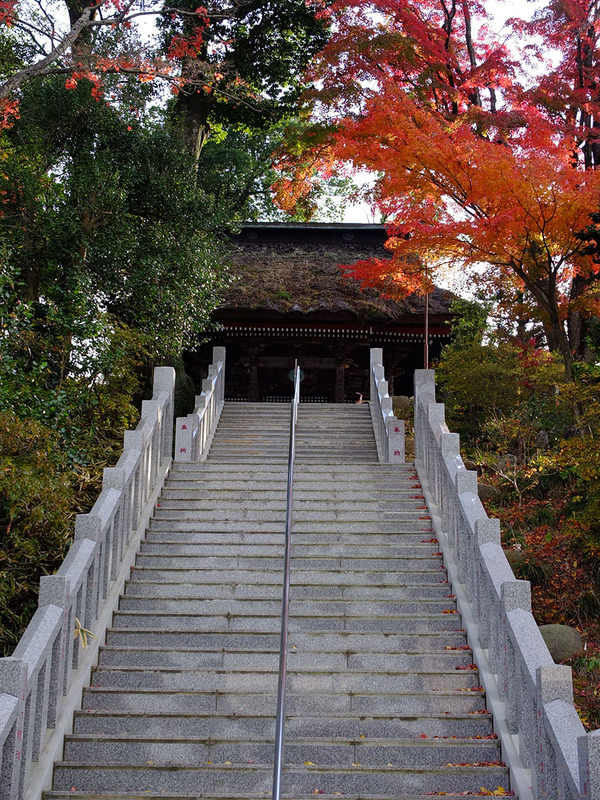 The temple is just a short 5 minutes trail ride out from Takasaki. 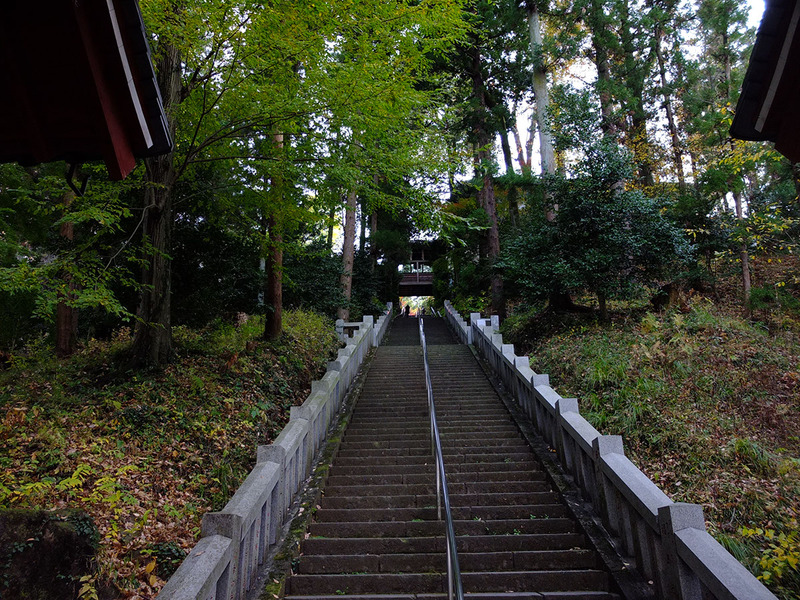 Get off at Gunma-Yawata station then a short 1.5k walk to the temple. The road went through low density suburb area. On either side were mostly one or two storey houses, except for a strangely located rice shop and what looked to be a car parts factory. Finally cross a busy bridge over a river and one arrives at the foot of the temple. I mistakenly went up via the parking access road on the side. All for the best as the main entrance was a very long flight of steps that would make all who visits bow in respect. The autumn leaves were at their peak, the temple halls nested amidst the steep hillside brushed with vibrant orange and red. It was a weekday and there were few people about. 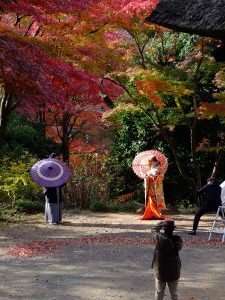 There was couple in traditional clothing getting their wedding album taking and two or three others here to pray and see the autumn leaves. 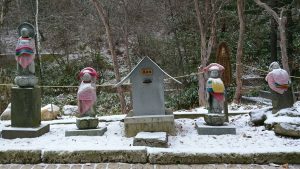 There were many dolls presented to the temple, some big, some small. Most were presented by businesses wishing for successes, the biggest ones were over a metre tall. 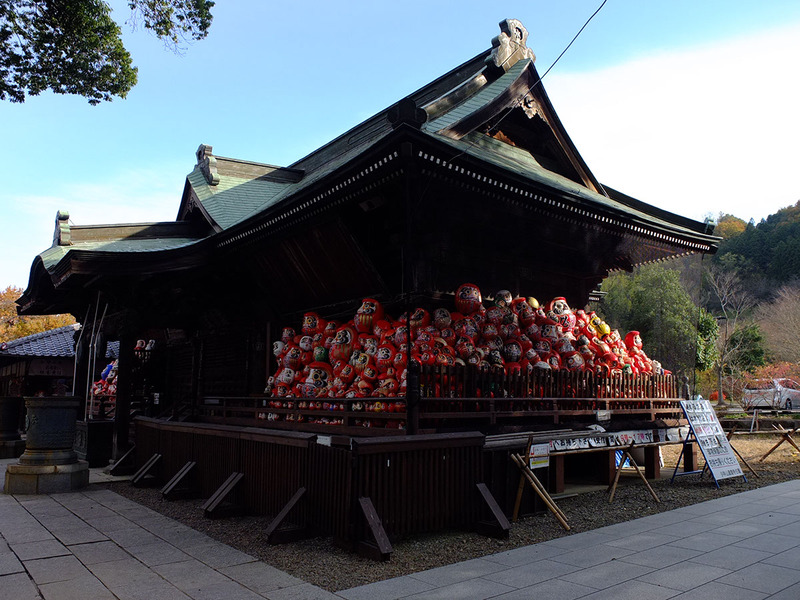 To one side was a small museum displaying hundreds of different Daruma dolls. On one wall was a map showing how the Daruma dolls differ between areas of Japan. 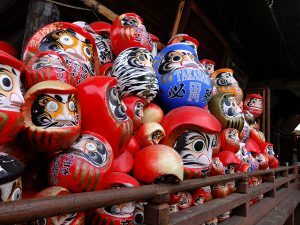 Daruma from Takasaki was the quintessential round squash shaped, some area had ones that were slender, some cylindrical, some more egg shaped. Some were cute, some had a regal expression, others stern and serious. I spent maybe 30 minutes at the temple. There was also only one train an hour back to Takasaki and it would take at least 10 minutes to get back to the station. After returning to Takasaki I picked up my luggage and hopped on a Shinkansen, this time an E7 train. The trip back to Ueno took 45 minutes and I estimated that I’d get to check in about half past 4pm. 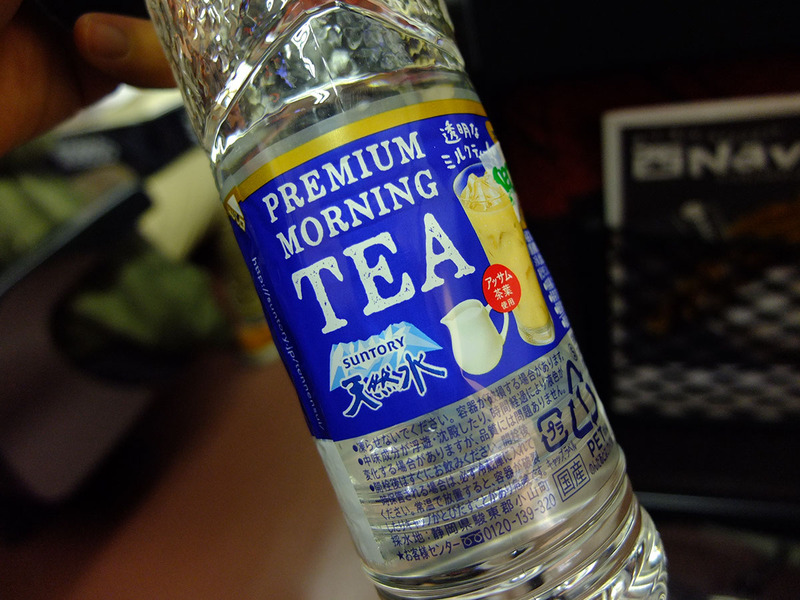 The transparent milk tea.. tastes worse than the real one. My hotel for the next two day was Villa Fountaine Kudanshita, a strange name since it was closer to Jimbocho station, even the Suidobashi station was closer. Coming from the shinkansen I had to first go from Ueno to Akihabara, transfer there onto Suidobashi. If I had known better I might have transferred at Tokyo station since transfering there to the Chuo line then transferring again at Ochanomizu required much less walking and stairs than Ueno and Akihabara despite the same number of transfers. 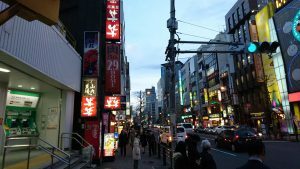 The area immediately outside the Suidobashi station was filled with izakayas, restaurants, pachiko and karaokes, before giving way to quieter office areas. Villa Fountaine was in one of those quieter areas, some 500 metres from Suidobashi and another two blocks to go till the busy main street above Jimbocho station. 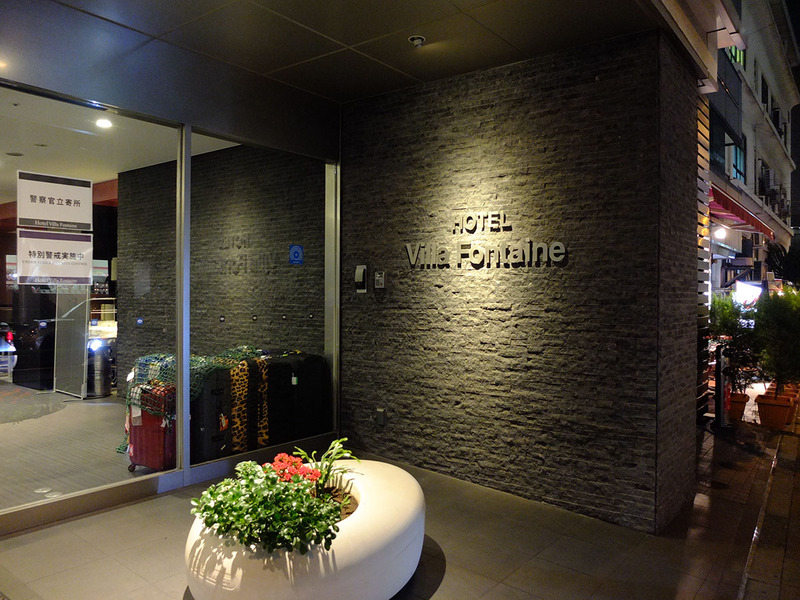 Villa Fountaine felt more western (not sure why, just a feeling). 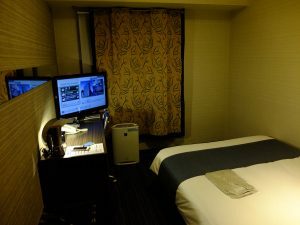 Its offerings is supposed to be on the higher side of business hotels and catering to foreigners (it has airport limousine and some of its hotels has shuttle bus running to Tokyo station) and comparatively does have a larger room. Something felt amiss however which I could not quite grap. 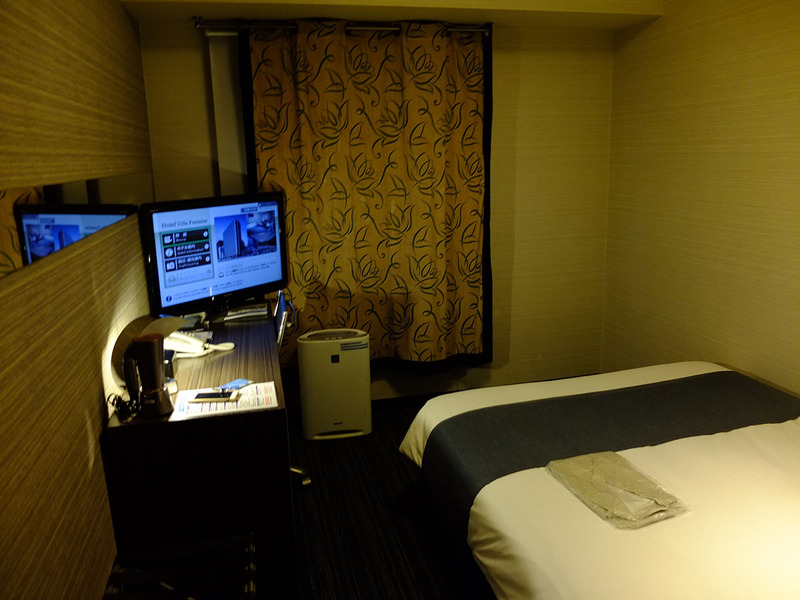 It could be the darker decor or the barebone amenities offered, it didn’t felt as welcoming. By the time I have settled in it was past 5pm. I grabbed a bento from the nearby supermarket and had dinner while browsing for where to buy a new tripod. BIC CAMERA at Akihabara was the closest and I decided to check out there instead. Not realizing that each BIC CAMERA might stock completely different items. Akihabara turned out to be not the best choice to look for tripods. 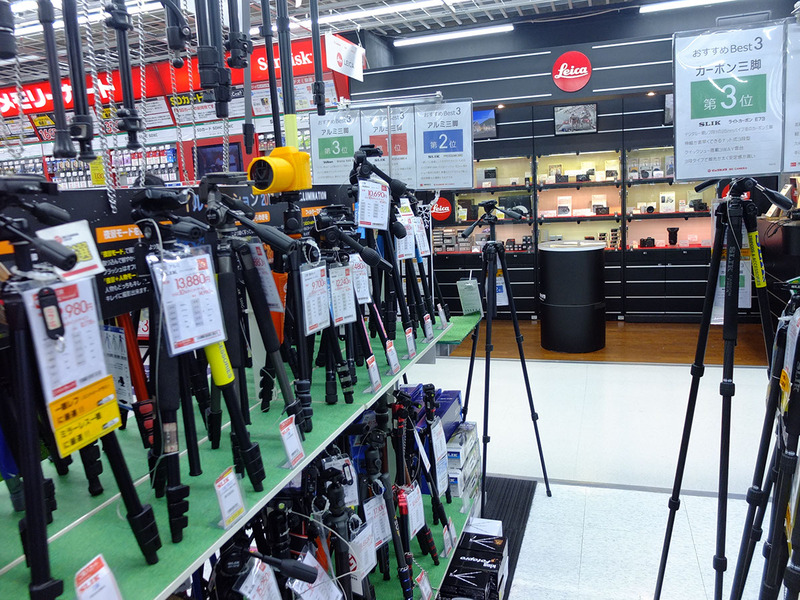 They had a good selection but all too professional; none of the cheap, small travel tripods I was looking for. 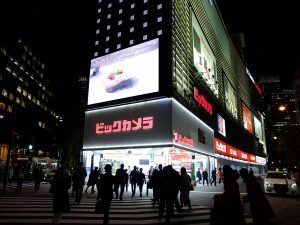 From their websites stock levels I deduced that the shop with the most selection was the Ikebukuro store. It was half an hour to get there. 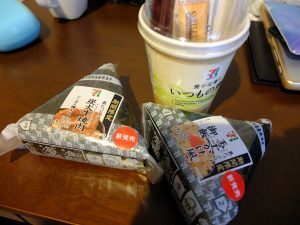 I had actually gotten to Ueno before realizing the Yurakucho one, a station south of Tokyo station, had almost as good a variety and it showed to have the one I wanted in stock. Immediate reverse, hop off the train and onto the one on the other side going the other way. 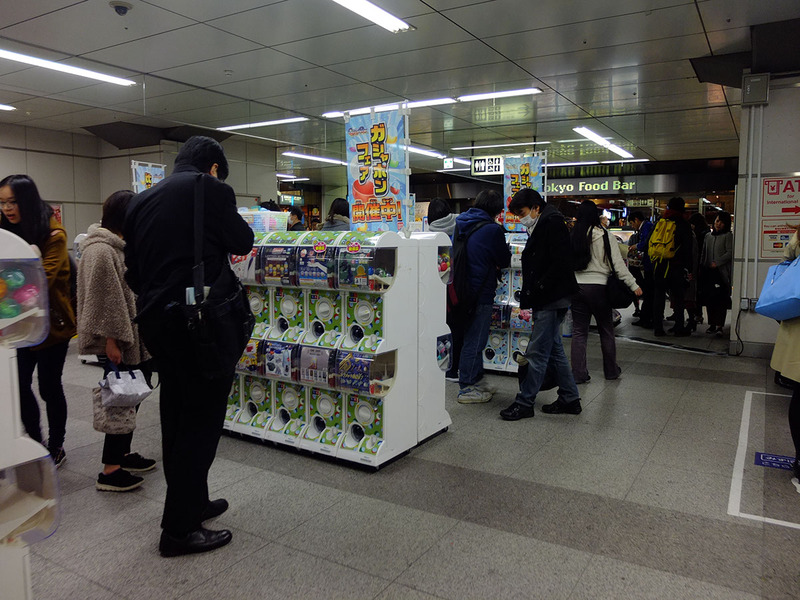 The BIC CAMERA is right outside the station, it did not seem bigger than the Akihabara store, just a different focus. 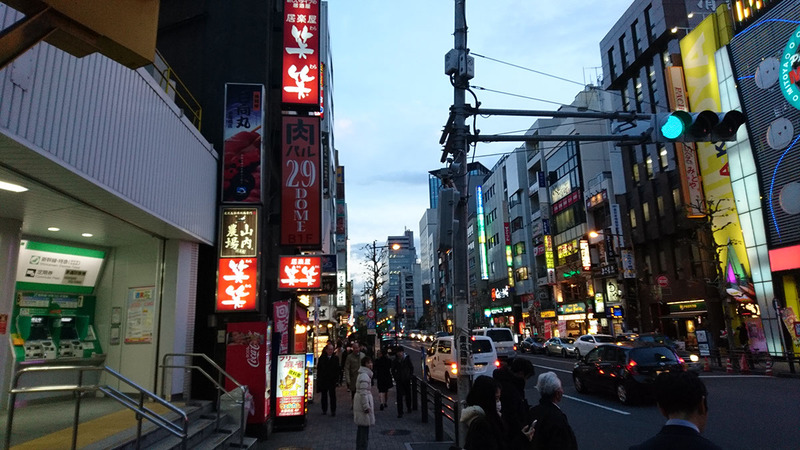 Cameras had half of B1 allocated as opposed to the small corner it occupied in Akihabara. Here there was a huge variety of tripods, from travel ones to big, heavy clubbing weapons aimed at professionals. 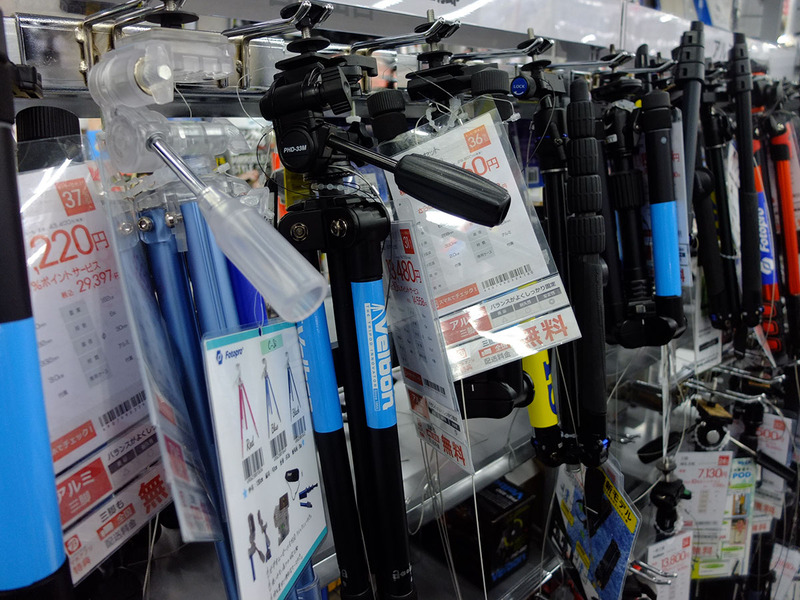 Curiously, some of the funky super compact tripods I saw at Akihabara were nowhere to be found here. I bought the tripod I had came here for then decided I might as well wander through the other floors and see what they sold. I was genuinely surprised when I found they had an entire floor dedicated to cosmetics and pharmaceuticals. The store was catering to Chinese tourists, I realized. Indeed, there were more tax-free counters than there were regular ones. In the games section, PS3 games were on clearance for 500 to 1000Y each. I thumbed through them, finding nothing of interest. A shame, would have been a treat if I could get the rest of the Atelier games. On the way back I went to the chemist store next to Suidobashi station and bought a small tube of handcream. BIC CAMERA sold handcream too but they were big bottles. 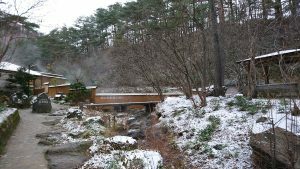 I had meant to get handcream before going to Kusatsu but the lost jacket that day took away all the time, now my fingers were hurting from exposure to the cold dry air.